Lion Malor lies down while his mother Lira walks past in the animal enclosure at Eifel zoo in Luenebach, Germany, in 2016. It is unknown whether these are the lions that escaped on Friday. BERLIN (CNN) - A bear was shot dead after it escaped from an enclosure at a zoo in western Germany on Friday, authorities have said. 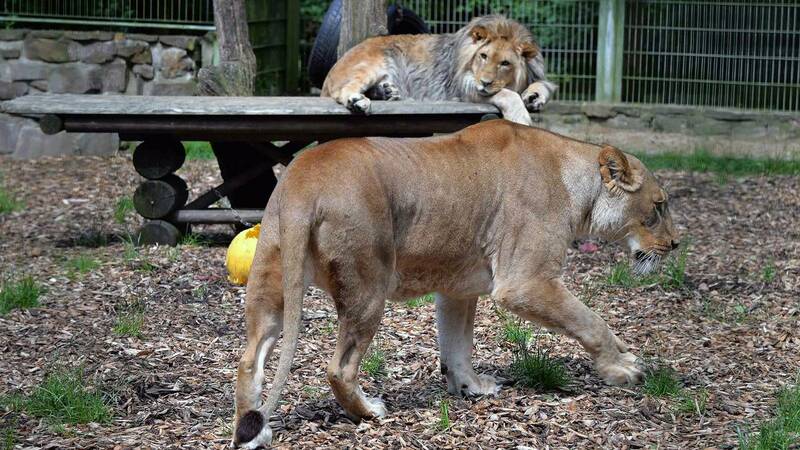 Earlier authorities from the Eifelkreis Bitburg-Prüm district said two lions, two tigers and a jaguar had escaped from the zoo, but officials later clarified that the big cats had never left their enclosures. Police had advised residents to remain indoors. While the warning was still active on the police website Friday afternoon, a spokesperson for the Prüm police clarified that the bear was the only animal at the park to break free. Marc Potzsch, a spokesperson of the district's disaster management organization -- which is made up of police and fire brigades -- said the bear had managed to leave its cage after a heavy downpour early Friday morning. The high rainfall had caused zoo cages to flood and authorities had initially been unable to verify the whereabouts of cats, sparking fears of a mass breakout. In reality, the animals had climbed to higher spots that were not visible from outside the cages, Potzsch said. The cages were being checked by structural engineers to determine whether the animals can stay remain inside their enclosures or have to be placed in more secure places, he added. The Eifel Zoo, which is located on the outskirts of Lunebach, around 11 miles (18 kilometers) from the Belgian border, is home to about 400 animals, according to the zoo's website. These include a Siberian tiger and African lions. Yannick Becker, who lives just over a mile from the zoo, posted video and images of flooding on the River Prum, which flows just to the east of the zoo. "There hasn't been a flood like this here for at least 70 years," Becker told CNN. He said he had heard from the fire department that two storms had collided to cause unusually high levels of rainfall. "As far as I know, a dam broke in the Eifel Zoo, which caused the area to be flooded," he added. Copyright 2018 by CNN NewSource. All rights reserved. This material may not be published, broadcast, rewritten or redistributed.